Birth May Elizabeth Coulson was born in 1886. Birth Sara Thurlow was born on 12 December 1991. Death She died on 12 December 1991 at age 0. Birth John Thurley was born in 1772 at Yelling in Yelling, Huntingdonshire, EnglandBG. Chr He was christened on 25 October 1772 at Swavesey in Cambridgeshire, EnglandBG. Marriage He and Ann Ward were married on 11 October 1796 at Conington in Cambridgeshire, EnglandBG. Marriage He and Sarah Jetson were married on 2 September 1827 at Conington in Cambridgeshire, EnglandBG. Death He died in April 1835 at age ~63 in Conington, Cambridgeshire, EnglandBG. Burial He was buried on 30 April 1835 at Conington in Cambridgeshire, EnglandBG. Birth Ann Ward was born about 1775 at Conington in Cambridgeshire, EnglandBG. Marriage John Thurley and she were married on 11 October 1796 at Conington in Cambridgeshire, EnglandBG. Burial She was buried in 1825 at Conington in Cambridgeshire, EnglandBG. Chr James Thurley was christened on 16 August 1801 at Conington in Cambridgeshire, EnglandBG. Marriage He and Mary Ward were married on 20 February 1821 at Fenstanton in HUN, EnglandBG. Burial He was buried on 1 August 1856 at St Mary Magdalane Church in Hilton, Huntingdonshire, EnglandBG. Chr William Thurley was christened on 16 April 1797 at Conington in Cambridgeshire, EnglandBG. Marriage He and Elizabeth Canwell were married on 26 April 1821 at Conington in Cambridgeshire, EnglandBG. Death He died after 26 April 1821. 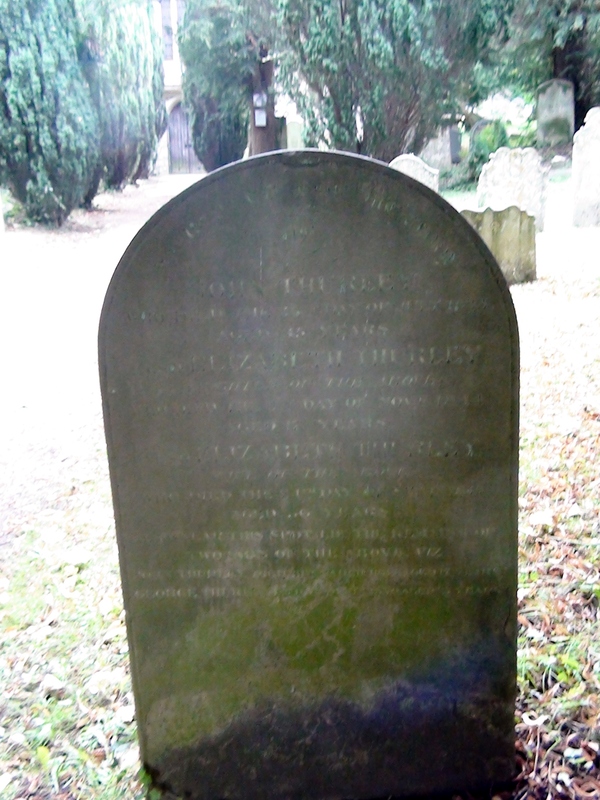 [GS] Gravestone of John Thurley at Amwell, Hertfordshire. Birth John Thurley was born in 1799 at Conington in Cambridgeshire, EnglandBG. Chr He was christened on 12 May 1799 at Conington in Cambridgeshire, EnglandBG. Marriage He and Mary Ann Pearsall were married on 29 November 1829 at Holborn in London, EnglandBG. Chr Charles Thurley was christened on 12 July 1807 at Conington in Cambridgeshire, EnglandBG. Death He died after 17 July 1807. Chr Philip Thurley was christened on 9 July 1809 at Conington in Cambridgeshire, EnglandBG. Chr David Thurley was christened on 3 November 1811 at Conington in Cambridgeshire, EnglandBG. Burial He was buried on 10 January 1836 at Conington in Cambridgeshire, EnglandBG. Chr Richard Thurley was christened on 13 December 1812 at Conington in Cambridgeshire, EnglandBG. Marriage He and Sarah Holben were married on 6 May 1834 at Conington in Cambridgeshire, EnglandBG. Death He died in 1870 at St Ives in HUN, EnglandBG. Chr Thomas Thurley was christened on 28 May 1815 at Conington in Cambridgeshire, EnglandBG. Birth Matthew Thurley was born in 1817 at Conington in Cambridgeshire, EnglandBG. Chr He was christened on 12 October 1817 at Conington in Cambridgeshire, EnglandBG. Marriage He and Sarah Capon were married in 1839. Death He died in 1872 at age ~55 at Holborn in London, EnglandBG. Birth Sarah Jetson was born about 1800 at CAM in EnglandBG. Marriage John Thurley and she were married on 2 September 1827 at Conington in Cambridgeshire, EnglandBG. Burial She was buried on 12 June 1856 at Elsworth in Cambridgeshire, EnglandBG. Birth Elizabeth Canwell was born about 1800 at Conington in Cambridgeshire, EnglandBG. Marriage William Thurley and she were married on 26 April 1821 at Conington in Cambridgeshire, EnglandBG. Death She died after 26 April 1861. Birth Mary Ann Pearsall was born about 1807 at Islington in London, EnglandBG. Marriage John Thurley and she were married on 29 November 1829 at Holborn in London, EnglandBG. Birth Mary Ward was born in 1803 at Fenstanton in HUN, EnglandBG. Chr She was christened on 4 September 1803 at Fen Drayton in Cambridgeshire, EnglandBG. Marriage James Thurley and she were married on 20 February 1821 at Fenstanton in HUN, EnglandBG. Birth Sarah Holben was born at Conington in Cambridgeshire, EnglandBG. Chr She was christened on 8 March 1813 at Elsworth in Cambridgeshire, EnglandBG. Marriage Richard Thurley and she were married on 6 May 1834 at Conington in Cambridgeshire, EnglandBG. Birth Susan Pearsall was born about 1810.